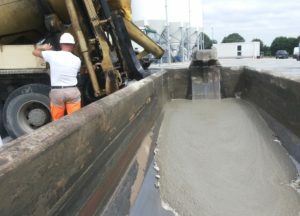 The recycling concrete tipper is reserved to the receipt of fresh concrete excess. Place the concrete tipper under a flat slab – preferably concrete-made. Carefully peel off any concrete remains using a scraper.Make sure that the detachment corner is well placed against the front wall. Remove any deposits that are preventing the corner to be in contact with the front face. Use the special oil release agent to spray all over the inside of the concrete tipper.Check if the doors are properly closed. 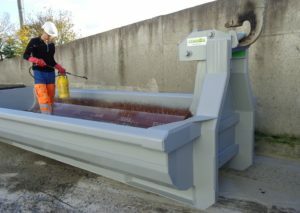 Dump only the concrete scrap and any other product which has not hardened. If necessary rewet the concrete to obtain a very fluid consistency. Begin filling the concrete tipper bucket, preferably starting with the front place. Fill the concrete tipper by pouring successive layers – make sure that upper part of each layer is flat and does not overflow. Please do not mix the concrete returns with anhydrite, lightweight concrete or any kind of sludge. Do not move the concrete tipper during filling. Allow the concrete to harden a few hours. Make sure that the hardened concrete cannot detach during transport; scrape it if necessary. Align the truck with the concrete tipper, load the concrete tipper without forcing the guide rollers. Make sure the concrete tipper is properly secured on the chassis before you leave. Open the door – attach it to ensure it will not close. Check if the block is well detached. Should the block still be soft, place the concrete tipper on the ground with the door opened, remove the front pin, lift the peeling corner to its highest point and drain the concrete tipper. Please do not remove the door pin of the closed concrete tipper. Place the truck’s front wheels in line, make sure there is no obstacle in front of it and gently lift the concrete tipper without any sudden gesture. Move the truck when emptying the concrete tipper and simply close the door before getting back on the road. Before closing the door, please make sure that any milt hardened grout residues have been properly removed.